Whatever your application there’s a Mr gasket micro electric fuel pump born to do the job. Gasoline diesel even ethanol there’s 1000000 uses for everyone. 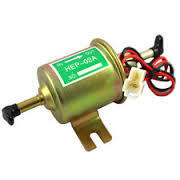 Diesel engine get the 12 D. micro electric fuel pump. It flows 35 gallons per hour at 47 PSI is self priming and comes with a 100 microns in line fuel filter running race still are methanol get the 12 eat it’s just as efficient with ethanol and E. 85 close 35 gallons per hour at 4 to 7 PSI is self priming and comes with a 100 microns in line fuel filter 12 US and 42 S. micro electric fuel pumps work equally well as skill transfer or booster pumps the 12 US is specially designed for domestic 54 cylinder engines inflows 35 gallons per hour at 47 PSI. It’s self priming and includes a 40 my fraud in line fuel filter got 46 cylinder import there’s a micro electric fuel pump perfect for that too. It’s the 42 S. and it flows 28 gallons per hour at 2 to 3.5 PSI. It’s also self priming and includes a 40 micron in line fuel filter so if you’re looking for better performance or just transfering fuel from a 55 gallon drum into a 5 gallon gas can there’s a Mr gasket micro electric fuel pump perfect for the job. Get one today. Previous Post: eHorizon – saving of fuel and improving of safety.